DUMBARTON claimed a massive three points in a pulsating encounter at the Cheaper Insurance Direct Stadium tonight, beating Queen of the South 4-2 with an impressive second half fightback. 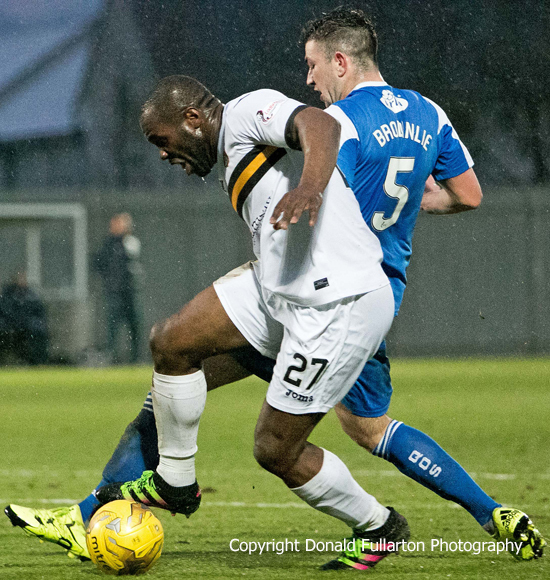 DUMBARTON claimed a massive three points in a pulsating encounter at the Cheaper Insurance Direct Stadium tonight, beating Queen of the South 4-2 with an impressive second half fightback (writes Simon Barrow). The match got off to a great start for Dumbarton. On four minutes, Queens goalie Robbie Thomson cleared straight to Christian Nade (pictured), who ran 20 yards and finished brilliantly to put the home side ahead. Then on 28 minutes ex-Son Iain Russell did what he has done so often in games against his old team, levelling the score with a stunning strike from the centre of the box into the top right-hand corner of the net. Just before half time the visitors struck another blow. Following a defensive lapse from Dumbarton, Alex Harris hit a shot from outside the area, low and to the right of Jamie Ewings, making it 2-1 to the Doonhamers. Despite slightly more possession, Sons were labouring. But immediately after the break the game turned on its head. On 48 minutes Tom Walsh's screamer from 15 yards gave Dumbarton an equaliser. Just two minutes later Nade claimed his second of the night, heading in at close range from a Mark Docherty corner. Suddenly it was 3-2 to Sons. On 84 minutes Dumbarton won a penalty after a foul in the area on Gregor Buchanan. Up stepped skipper for the night Garry Fleming to convert the spot-kick for 4-2, claiming his tenth goal of the season. The result puts Dumbarton five points ahead of Livingston, with a game in hand and four matches remaining.